As it was International Volunteer week this week and we at Valleys Steps wanted to show our appreciation to the wonderful people who keep our operation afloat! They are the friendly face that every attendee meets when they come through the door. So what better way to celebrate their contribution than a mindful day out in the park? We are happy to announce we will soon be running an open access outdoor mindfulness session on August 15th at 6.00 PM. Our volunteers were lucky enough to partake in a dress rehearsal and picnic ahead of the big day. 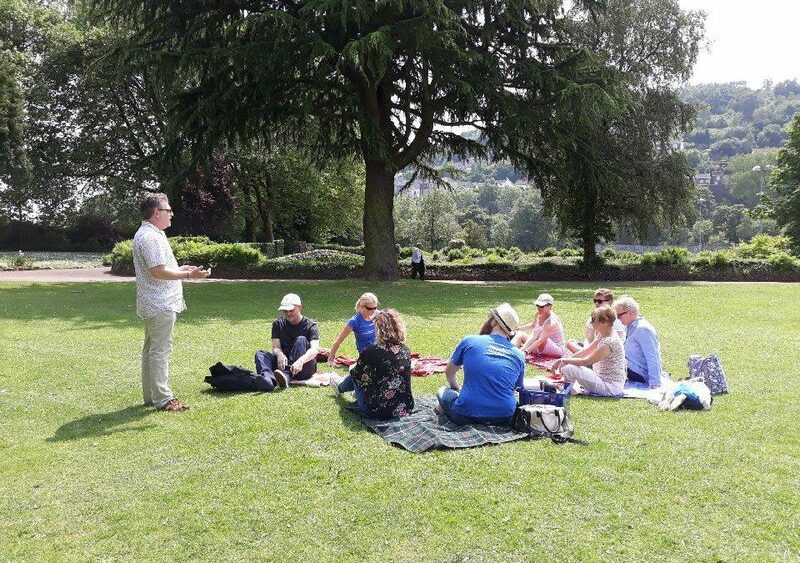 Our course practitioner Paul Griffiths started proceedings with mindfulness meditation making use of the sights and sounds in their beautiful surroundings. While we often teach people to accept the imperfections in the moment, on this day there was no need. There wasn’t a cloud in the sky, or a dip in their spirits. Days like this are an opportunity to build strong relationships and cohesion in our team. Many volunteers brought their own food fostering street party atmosphere. If the event on the 15th of August is anything like this, it will be very popular indeed!